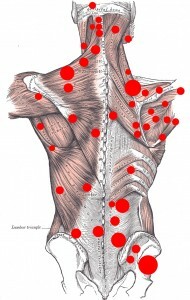 What Trigger Point massage can do for you? It can help with Tension Headaches, Migraines headaches, Cluster headaches, Headaches from Trauma,Temporomandibular Joint Dysfunction (TMJ), Head, Facial, or Neck Pain, Sciatica, Limited Rage of motion, Hip or Knee pain. Trigger point massage can help! Yes it can! First we must understand what is a trigger point, how are they formed and what do the feel like when you press them? The largest organ in the human body is the muscles, and is almost 50% of our body weight. If we were to count all the muscles there would be approximately four hundred muscles and each muscle is individually different. When it comes to trigger points any of these muscles can develop one or more and potentially cause pain, referred pain and dysfunction. Most people will say, “I have a knot in my shoulders or that it is tight here between my shoulders or here in my neck is a tender spot.” These are some of the ways that we are really describing what a trigger point really is. Most of the time when you feel pain in one spot that is the trigger point, but sometimes when you press a trigger point it will hurt somewhere else, this is what we like to call “referred pain”.